Picture yourself living in a quiet, picturesque place. A place straight out of a picture postcard. A place with no traffic, yet everything you need no more than a short drive away. A place where you rarely hear a car, but can almost always hear the water caressing the shore. A place where you can hear the laughter and the conversation flowing as you graciously, yet casually entertain friends and family. A place that’s light and airy and best of all, all yours. Yes, picture yourself establishing residence at 17 Champlin Drive in beautiful Avondale. Avondale is that special slice of real estate nestled unobtrusively between the town of Westerly and the shores of Watch Hill. 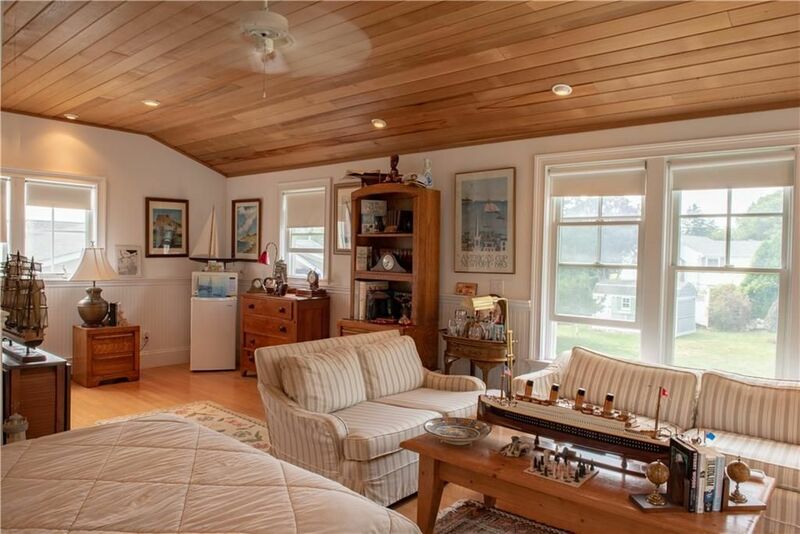 You’ll never want to leave this home that boasts a generous 2259 square feet because just about everything you’d want to do is contained in this completely renovated shingle style cottage. First things first: this outstanding home is in move-in condition. No, that’s not a cliched real estate term; it’s the way this home is being presented right now. It is whistle clean, beautifully decorated, needs no coat of paint nor cleaning lady for you to put your own special touches on the seven open concept rooms and move in a mere hour after you close! 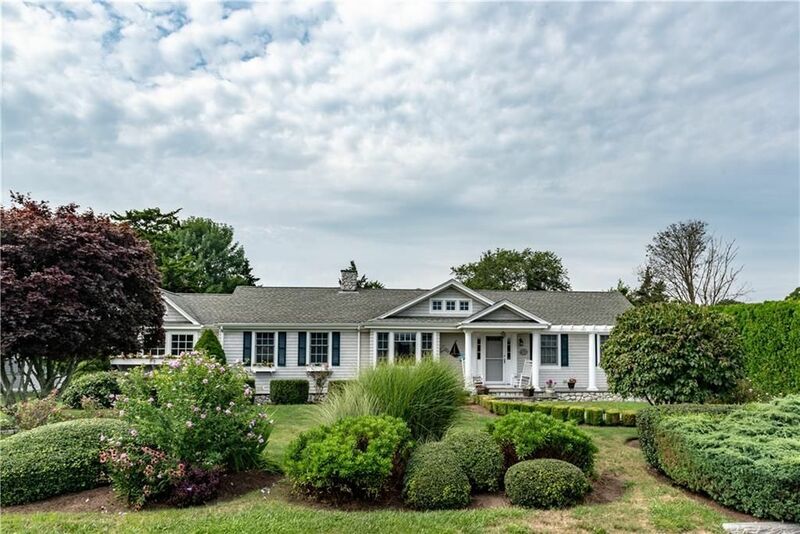 Situated on a nicely manicured double lot you’ll appreciate the specimen trees in the back yard, as well as the blackberry bush with fruit so big and sweet you’ll pop them in your mouth before you even get them to that great designer kitchen with the open concept. One look at this kitchen with the granite counter tops, loads of cabinets, and modern appliances, and you’ll be making out the guest list for your first housewarming party. The kitchen opens right into the great room, and this is indeed a GREAT room with a built in TV and two fireplaces to keep you cozy, one gas and one wood-burning. Keeping the open concept, the traffic pattern naturally flows into a dining room, not walled, but open, airy, and bright like all the other rooms in this very special Avondale home. From the great room enjoy yet another bonus as you enter a home office attached to the master bedroom. You’ll marvel at the built-in desk and shelving, so all you need is to bring your computer and get to work! Additionally there’s an overly spacious closet in this space to hold all your files, supplies, electronic accessories, and more. Just off the office/master bedroom combination there’s a bath with both jacuzzi and shower. Ready for yet another bonus? While relaxing in the jacuzzi, pour yourself a glass of wine and watch your favorite program, because facing you is a built-in TV! So lie back, relax, and enjoy. The Master wing is a fairly recent addition to this extremely well built cottage that dates back to 1952. It is designed to offer sunlight from every direction, bringing the outdoors in, while still fiercely guarding your privacy and a good night’s sleep. Next to the kitchen and across the hall from a half bath, there’s a stackable laundry with Whirlpool washer and dryer. The home is centrally air conditioned, and there’s a built-in generator, so if the power should ever go out during a storm, you are fully protected. Doesn’t that feel good? Two more generous bedrooms complete this home which features baseboard heat and gas. But there’s yet another bonus just waiting for you outside! The one car garage has overhead doors both front and back, allowing easy access to the backyard and side yard boat storage. No, you don’t have to have a boat to live here, but Avondale might just get you thinking...and wait till you see what’s built over the garage! Yes, over, for these smart owners have added a bonus room with private deck, wood bead board ceiling, and yet another full bath. Great for company who value their privacy, and great for you. And when you or that company come inside from time spent at the nearby shore, there’s an outside shower to wash off the sand before entering the living space. There’s plenty of room in the backyard if you wish to add a pool, but know that you also have access to a shared dock with a mooring ball so you may safely secure that boat if you have one or get one! This is without a doubt one of the most outstanding properties we’ve featured in Places. There has been a tremendous pride of ownership, there is pride from the listing agent and broker who represent it, and it needs absolutely nothing...except you. So picture yourself living at 17 Champlin Drive. Welcome to Avondale. Welcome Home. List price: $1,695,000, Real Estate Taxes: $10,816. To make an appointment to put yourself in the picture, contact Listing Agent: Sarah Cooper at 401-378-0548 or email: sgcooper5@yahoo.com or Broker: Olga B. Goff ogoff2@yahoo.com, 401-212-7402.